Cast: Higashide Masahiro, Saotome Taichi, Katsuji Ryo, Nagayama Kento and Yagira Yuya. 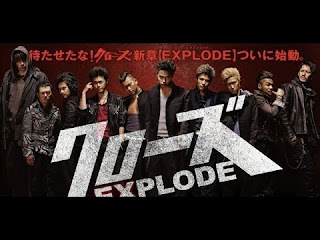 This movie is a sequel to CROWS ZERO 2, and the third movie in the series. Kaburagi Kazeo (Masahiro Higashide) is a new transfer student at Suzuran High School. As he arrives he witness’ a fight between the current TOP Goura Toru (Yagira Yura) and another student. The fight is interrupted by Kagami Ryohei (Saotome Taichi) who arrogantly announces he will be the TOP. While commotion is going on, Kazeo refuses to fight but knocks out a student whose attacking him, with a single punch. Former mobster Katagiri Ken (Yabe Kyosuke) encounters Makise Takashi (Takahashi Tsutomu) and while the two converse Makise offers Ken to work at the mechanics shop with him. It is soon revealed that Ken used to work for Ryohei’s father, who was the head of the gang, and had helped take care of Ryohei when he was little. I gotta apologize for the summary, I really tried not to spoil, but it is very hard to explain this movie. If I were to compare the movie with the other two I have to say it’s not as good, and I honestly can’t blame it on the cast. This movie is bad because of the story. Very little focus is used on the relationships between the characters, and they used way too much time on Makise and Ken. I know that they tried to give a bit back to the fans of the series, but with an entire new cast, I kind of felt that I never really got to know the new characters. It is hard to trump the originals I agree, but they didn’t give them much space to grow tbh. Though the layout of the school was much better, and the quality of the surrounding was better - but still isn’t good of the overall doesn’t work. I mean they did try to go all out, but the ended up having too much. All in all, okay movie, but not close to the originals.